Holiday Survival Kit: Do you have one? December brings joy and celebration, that’s for sure. Alongside that it brings over-eating, indulging in drink, and perhaps less focus on healthy eating. Sigh. 🙁 We all go there from time to time, and I am no exception! So, what can we do to make sure we stay healthy during the holidays? I’ve certainly been prone to burning the candle at both ends and making the most of festive treats this December, so I’ve decided to replenish my body with a Holiday Survival Kit from Herbtheory. The kit is made up of three packs in capsule form. First, there’s Weight Management which aims to help promote optimal weight management (this happens when accompanied by diet and exercise, so I’m not forgetting to work out when I can). Secondly, if you’re anything like me, and find the packing up, wrapping presents, hectic schedule, travelling, endless to-do lists, and trying to remember if you’ve got presents for all your nieces and nephews pretty stressful, then the Stress & Sleep capsules are perfect. Even out of the holiday season I’m a stress-head with an insomnia problem (so much so, I even went on the Dr. Oz show to talk about it!). These capsules help to reduce stress by inducing relaxation and can aid you with occasional sleeping difficulties. I’m also a big fan of a detox and my liver needs some help after all those festive drinks, so a 2-day detox in the middle of all the madness is just what my body needs to regain its energy and to revitalize. The 2 Day Detox helps to promote optimal energy levels with a gentle and effective detox and supports optimal intestinal health and liver function. Hallelujah for that! All products are vegan, Gluten-free, and made from wild-crafted herbs. The idea is that you take take 2-3 capsules with a meal, once per day. This is my five-day Holiday Survival Kit diary, written ten days after my 40th birthday celebrations (which were crazy!) and one week prior to Christmas (which will be indulgent!). My body feels like it’s been in a train wreck, which thankfully it actually hasn’t. I’ve just been partying hard and I need to get my body re-balanced. I also need to catch up on my sleep and de-stress from the endless to-do lists that accompany my life. I often can’t sleep for thinking of things. Time for the Stress & Sleep tablets. In addition, I’m not going to pretend that the partying hasn’t added a few pounds to my usually fit and trim body. I can feel that mid-life roll creeping in, so I’m back to my disciplined exercise regimen and clean and lean healthy eating plan, and I’m adding in the Weight Management tablets. I slept so well! Hooray! It’s such a relief to feel calmer at bedtime and not to wake up at all hours. I feel brighter, clearer of mind and both my body and head feel less foggy and heavy. I’m not weighing in just yet, Those darstardly 5lbs will need to go sometime. It’s the last day of the detox, and I certainly like that my body is getting its balance and form back. I feel lighter and healthier and am resisting all temptations — even the British chocolate in the fridge! The Stress & Sleep formula is definitely helping me to relax at night, and I fall asleep much more easily. Happy nights ensue! Wow, three of those annoying pounds down. A mix of healthy eating, exercise and the Weight Management tablets have made this process so much easier. I know if I carry on with this blend I’ll rid myself of those party-pounds. These products are a great jump start to that healthier lifestyle. 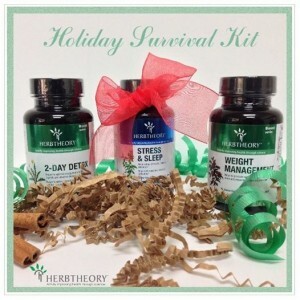 There’s still time to order your Holiday Survival Kit from HERBTHEORY before Christmas, so go for it. Don’t forget — New Year is just around the corner, and you’ll certainly be thinking about a detox and a healthier you after that, if most New Year’s resolutions are anything to go by!